Fisherman, what is best in life? Click here to play! To catch the biggest fish, see them gutted before you, and to hear the lamentation of those swimmin' that will soon be on the hook as well. Oh, also to win the top prize of the Reel in the Cash slots and take your buddies on an incredible fishing trip with the prize money. That's pretty good, too. If there are two best things in life, they are good fishing and winning the Reel in the Cash top prize. 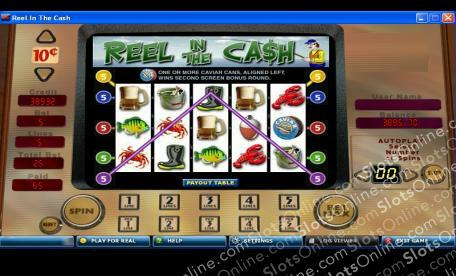 In the Reel in the Cash slots, you must try to get your hands on the Golden Lure, a legendary piece of fishing equipment that will draw all the fish in the sea to your location. There's a lot of ocean to look for it in, however, so in the meantime you can catch swordfish, sharks, and the occasional crab. Don't forget the schools of poker fish, either, such as the mighty Ace fish, the proud King fish, the regal Queen fish, the dangerous Jack fish, and the tricky 10 fish. Put some money on your hook and lure in the big jackpots by playing the Reel in the Money slots. It's like going on a fishing trip in the comfort of your own home. The Fisherman symbol is the scatter. It pays out on the total bet when 2 or more land on the reels, and it triggers the bonus feature when 3 or more land on the reels. The Golden Lure symbol is wild, and it can substitute for any symbol other than the scatter. The Fishing Follies feature is triggered when 3 or more scatter symbols land on the reels. In this game, the player is awarded 3 rounds. For each round, the player chooses a lure and casts off in an attempt to catch the best fish. The lure chosen acts as a multiplier of the prize for the fish that is caught. Prizes range from 2 times the bet to 25 times the bet. Autoplay can be set to complete on a number of spins from 1 to 99, plus it can be set to a certain number of lines and to a certain bet size per line. It may also be set to stop on a particular win amount, on a cumulative win total, or on a cumulative loss total.